I now have a decent backlog of posts, hopefully I can find time to get through them all. 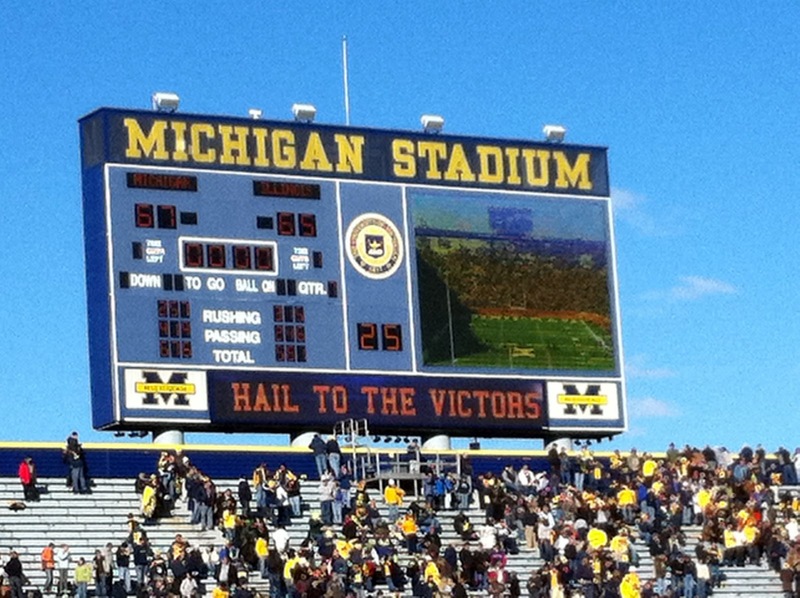 In honor of the past two Wolverine victories, I have a few photos and thoughts from the Illinois game weekend. Our Friday night, pre game meal was at the ever favorite and reliable institution known as Pizza House. We had a great crew with Carson's Montanan family visiting Ann Arbor. 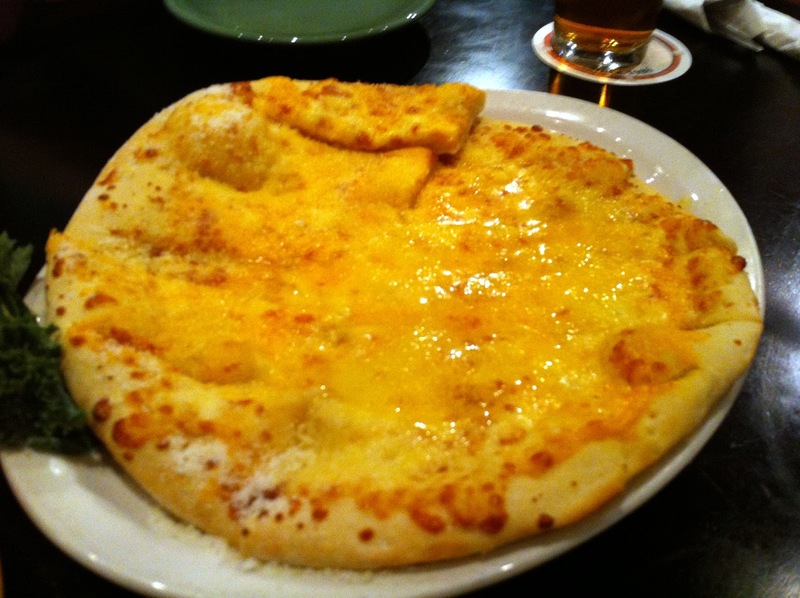 The meal started with deliciously cheesy and loaded with garlic "cheesy bread." Every student has had their fair share of cheesy bread. It was the best thing we ordered. Erica and I shared a Caesar chipati for starters. If you don't know what a chipati is, think of a large, whole wheat pizza filled with lettuce, cheese and dressing. 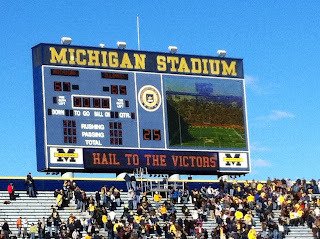 I don't know the origin of the chipati, but it is crazy popular in Ann Arbor. 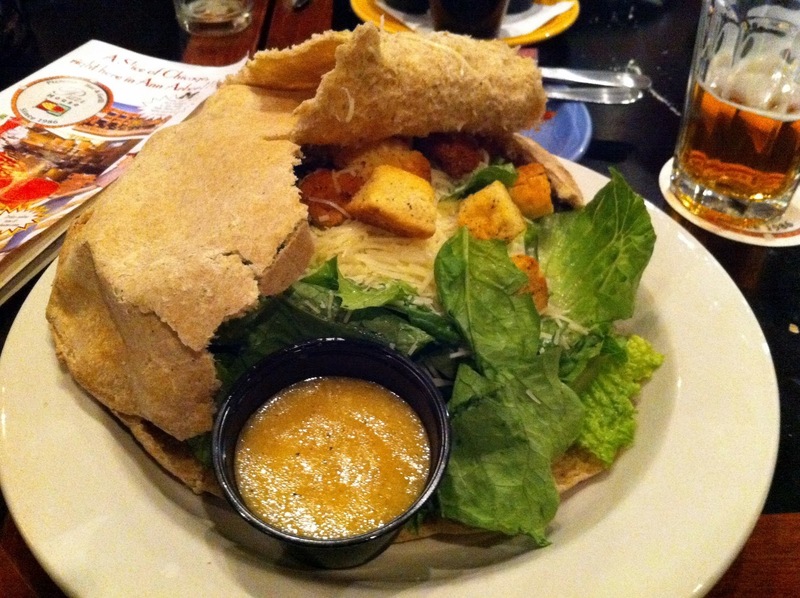 I like the combination of bread and salad all in one, and their dressing is very good. 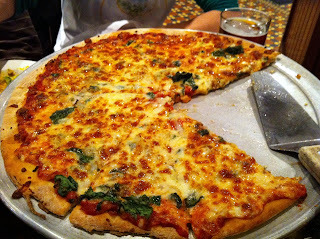 Finally, we ordered a pizza to share with the table: a thin crust cheese with onion, spinach and garlic. I'm normally a fan of Pizza House pizza, but this one was sub-par. Maybe the kitchen was a bit overwhelmed with the packed house, or maybe my tastes have changed since college, but I would not want to order that pie again. Oh well, the beer was gold, the atmosphere fun and our cheesy bread/chipatis were great. If I didn't have nostalgia I might be more critical, but sometimes college favorites forever remain college favorites. gotta love a thin crust! Just by the look of that melted cheese will show how delectable it is when consumed. As a fan of pizza, I always make it a habit to eat once a week at the various Italian restaurants and FL malls after I am done with the florida shopping with my family. Pizza once a week is quite a challenge. I know we Chicagoans prefer the deep dish stuff (Lou's! ), but eating one a week would be not advised from the docs.